Pick-up from Haridwar (Parking of Har-Ki-Pauri) at 7 AM &proceed to Barkot via Mussoorie. En-route visit Kempty fall. Upon arrival check in into the hotel, rest of the day is at leisure. Dinner and Overnight stay at hotel at Barkot. Reach Barkot and have proper rest. Acclimatize your mind and body to start a trek to Yamunotri from JanakiChatti. Once you reach Yamunotri. Morning leave for Janki Chatti via Hanuman Chatti & Fool Chatti. On arrival Janki Chatti start Trek of 06 Kms for Yamunotri, On Arrive Yamunotri Holi Dip in Surya Kund, then Pooja and Darshan of Shree Yamunotri Ji, and nearby temples, later trek back to Janki Chatti. On arrival Janki Chatti meets with driver and drives back to Barkot. Dinner & Overnight stay at Hotel. Hanuman Chatti: The confluence of Hanuman Ganga & Yamuna River. Yamunotri Temple: Maharani Gularia of Jaipur built the temple in the 19th Century. It was destroyed twice in the present century and rebuilt again. Surya Kund: There are a Number of thermal springs in the vicinity of the temple, which flows into numerous pools. The most important of these is Surya Kund. Divya Shila: A rock pillar, worshipped before entering the Yamunotri Temple. With packed breakfast & post Tea/ Coffee leave for Gangotri early in the morning. Offering prayers & pooja darshan, later drive back to Uttarkashi, en route visit Gangnani. Overnight stay at Uttarkashi. Gangotri: Gangotri temple is 18th Century temple dedicated to Goddess Ganga. It is located near a sacred stone where king Bhagirath worshipped Lord Shiva Ganga is believed to have touched earth at this spot. Accordingly, to another legend, Pandavas performed the great Deva Yagna here to a tone the death of their kinsmen in the epic battle of Mahabharata. The temple is an exquisite 20 ft. high structure made of white granite. Gangnani: Further up on way to Gangotri, is the hot water spring at Gangnani, where one can have refreshing bath in the kund called Rishikund. There is a temple near the kund dedicated to the Sage Parashar, believed to be the father of Ved Vyas. Ritual and Activities: Perform Snan at Gangotri Ghat (VIP Ghat), Ganga Pujan & Aarti at Gangotri Ghats, Darshan of Bhagirath Shila, Darshan of Gauri Ganesha Temple, Finally Gangotri Temple Darshan after that you must have Darshan of Surya Kund. While returning Darshan of Gupteshwar Mahadev temple in Dharali , Interact with Tibetan Culture and people in Harsil. About Gaumukh (Its not included in Package, if you want to visit Gomukh its required 2-3 days extra): Gaumukh is where the waters of Ganga trickle down from the glaciers. The sages called it 'Gaumukh', because in the distant past, it probably appeared like a cow's mouth; though today it no longer appears so. The Gaumukh glacier is the source of Bhagirathi (Ganga) and is held in high esteem by the devouts who do not miss the opportunity to have the holy dip in the bone chilling icy water. It is 18 kms. from Gangotri. There is a Tourist Bungalow at Bhojbasa, 14 kms. From Gangotri where lodging and other facilities are available. From Gangotri we move along the beaten track towards Chirbasa, which is on the tree line. From here, we can get a clear view of the Bhagirathi Peak. Leave very early in the morning after breakfast for almost day long drive to Rudraprayag or Sitapur. On your drive, you would pass through Ganga and latter Alakhnanda giving way to Tehri Dam (The Hydro Electric Project). Overnight stay in the hotel at Rudraprayag/sitapur. Rituals & Activities: Visit of Tehri Dam,Rudraprayag & Sangam Darshan ( Merge of Alaknanda & Mandakini). Morning drive to Phata Helipad to board the helicopter for Shree Kedarnath Ji. On arrival, spare 2-4 hrs at the temple for darshan/pooja. Later return to Phata then Rudraprayag/Sitapur for overnight stay. OR Morning drive to Gaurikund (16 kms drive-one way). On arrival Gauri kund start your journey on the tough trek ahead. On arrival Kedarnath freshening up, perform Pooja and also Darshan at Shri Kedarnathji and enjoy the evening aarti a life time experience in the land of Kedar Baba. Stay at Kedarnath Ji in Govt provided camps or huts on your own. Its free arrangement by the government and will be booked directly by the visitors on spot as per availability. However, we will provide our local assistance for the same. Amidst the dramatic mountainscapes of the majestic Kedarnath range stands one of the twelve 'Jyotirlingas' of Kedar or Lord Shiva. Lying at an altitude of 3584 mts. 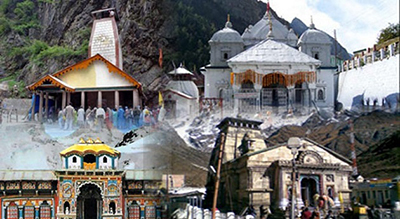 on the head of river Mandakini, the shrine of Kedarnath is amongst the holiest pilgrimages for the Hindus. Kedarnath is a majestic sight, standing in the middle of a wide plateau surrounded by lofty snow covered peaks. The present temple, built in the 8th century by Adi Shankaracharya, stands adjacent to the site of an earlier temple built by the Pandavas. The inner walls of the assembly hall are decorated with figures of various deities and scenes from mythology. Outside the temple door a large statue of the Nandi Bull stands as guard. Dedicated to Lord Shiva, the exquisitely architectured Kedarnathtemple is said to be more than a 1000-year-old. Built of extremely large, heavy and evenly cut gray slabs of stones, it evokes wonder as to how these heavy slabs were handled in the earlier days. The temple has a "Garbha Griha" for worship and a Mandap apt for assemblies of pilgrims and visitors. A conical rock formation inside the temple is worshipped as Lord Shiva in his Sadashiva form. This year we will have opportunity to see BHIM SHILA a new mythological attraction for pilgrims. A giant stone protected Kedarnath Ji Temple during disaster time. Note: This year the trekking to Kedarnath Ji has been increased by few Km and visitors will be recommended to make thair return same day as earliest possible. We would advise those are not physically strong to cover this trek on feet they should hire some assistance like Pony or Pithus to complete the Yatra without any hassle or complication. Rituals & Activities: Visit Darshan of Kedarnath Ji. Chance to meet Gurus and Sadhus meditating for long time in Kedarnath. It is extra day for you (whoever is using helicopter services because weather in kedarnath ji is unpredictable, so to complete you darshan/Yatra we always advise to keep extra days in your hand) OR Early Morning trek down for Gaurikund. Then drive back to Rudraprayag. We have this day leisure for relax for those who have trekked Kedarnath Ji yesterday. 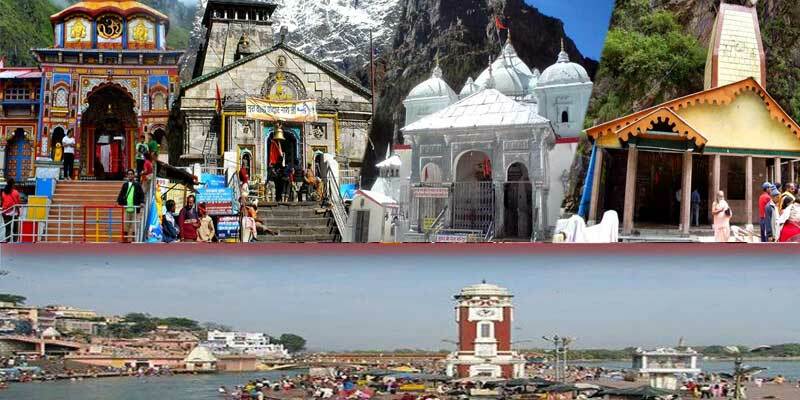 Next day we can proceed to Shri Badrinath Ji Yatra from Rudraprayag. However, those are feeling better they can make small excursions to some beautiful and most famous sights of Rudraprayag surrounding. Overnight stay in Rudraprayag/sitapur. Rudraprayag: It is the confluence of river Mandakini and river Alaknanda. Temples: Rudranath and Chamunda Devi, Koteshwar Temple (3 Kms). Rituals & Activities: Visit Guptkashi, Darshan of Kedarnath Ji. Chance to meet Gurus and Sadhus meditating for long time in Kedarnath. Morning after breakfast, check-out from the hotel & transfer to Rudraprayag, Visit to Mana Village (Vyas Cave, Ganesha Cave, Keshav Prayag, Darshan of Sarasawati Udgam (origin), Charan Paduka Darshan, Short visit of Ekadasi Gufa & hanuman Gufa. View of Vishnu Prayag ,Nandprayag , Karnprayag Govindghat and Pandukeshwar while returning back to Rudraprayag. En-route visit of Narsimha Temple Joshimath & Yogdhyan badri Teample. Later transfer to Rudraprayag for Dinner & Overnight stay. Mana Village: Inhabited by an Indo-Mongolian tribe, it is the last Indian village before Tibet. The women of the village offer Choli to the deity on closing day of the temple each year. Bhim Pul: On the other side of Mana village, a massive rock forming a natural bridge, lies over the roaring Saraswati river. It presents a spectacular view of water thundering down through the narrow passage under the rock and is believed to have been placed there by Bhim, the second eldest among the five Pandava brothers. Vyas Gufa (cave): Near Mana Village, this is a rock-cave where Ved Vyas is believed to have composed the Mahabharata and the pauranic commentaries. Narsimha Temple, Joshimath is about 1200 years old. Dedicated to Vishnu, the presiding deity of the temple is Narsimha, the half-man, half-lion and fourth incarnation of Vishnu. Like Badrinath, he is also sitting in the sukhasana. The characteristic feature of the deity is that its left wrist is very thin and is getting thinner by the day. At the beginning of every winter, the deity from the Badrinath temple is brought in a procession and kept in this temple for 6 months. En-route Visit Nand Prayag, Karan Prayag etc. Nandprayag: -- Nandprayag lies in Chamoli district on Joshimath-Badrinath road, 21.3Km from Karnaprayag and 10.5Km from Chamoli. Situated 914 meters above sea level, Nandprayag is believed to be the capital city of Yadu Kingdom in Dwapar Yuga. The legend says, King Nand had meditated at the confluence on a stone to lord Vishnu at this place. Lord Vishnu answered to his prayer and accepted to be his son but the same blessings was received by Devki, the sister of cruel King Kansa. To manage this situation, lord Vishnu took birth from Devki and was brought up by Nand-Yasoda. The stone in which King Nand meditated is used as the foundation of Nandprayag temple. The place derives the name from King Nand who meditated at the confluence of Alaknanda and Nandakini rivers. Hindu devotees take a dip at the sacred confluence Nandprayag before entering Nandprayag temple to perform pooja (worship). The mesmerizing beauty of two sister rivers meeting at the confluence will remain in your mind all your life. One fierce sister meeting another placid sister and both calming down to flow together offers an enchanting view. Karanaprayag: -- Karnaprayag, third or the middle one of the Panch Prayag in Dev Bhoomi Uttarakhand India lies in Chamoli district and sits 788 meters above sea level. Karnaprayag is the confluence of Alakhananda and Pindar river and also the municipal board of Chamoli district that connects Garhwal region with Kumaun region. Karnaprayag gets its name from Karna, the son of Suryadev (Sun God) and Kunti (mother of Pandavas, the heroes of Hindu holy epic Mahabharata). It is believed that te confluence of Alakhananda and Pindar river was the spot where Karna meditated to satisfy the Sun God and was finally blessed with the impregnable shield called Kavach and Kundal (armour and ear rings). Rudraprayag: It is the confluence of river Mandakini and river Alaknanda. Temples: Rudranath and Chamunda Devi, Koteshwar Temple (3 Kms). Morning after breakfast, check-out from the hotel & transfer to Haridwar.Enroute Visit Ma Dhari Devi Temple, Dev Prayag (Sangam of Alaknanda and Bhagirathi) From This Place this called Ganga. Risikesh: -- Triveni Ghat: Participate in Ganga Aarti at Triveni Ghat at Rishikesh A confluence of three holy important Rivers the Ganges, the Yamuna and the Saraswathy, is a most revered sacred bathing spot in Rishikesh and is situated on the banks of Ganges River. It is of belief that those who take a dip in water at this ghat washes away all the sins and purifies the soul and will have salvation, a relief from all sins carried out; the water here has the power to purify them. Daily in the morning and evening there are thousands who take bath here and enjoy the Maha Aarti being performed. It very soothing to sit on the banks of the river and enjoy the cool breeze from the river. Trayambakeshwar Temple- On the east bank of the Ganges at Lakshman Jhula Bridge, is 13 stories high, with different deities throughout. Lakshman Jhula – Ram Jhoola is 450 feet long an iron suspension bridge situated in Rishikesh in Indian state of Uttarakhand. Lakshman Jhula is one of the most prominent landmarks at Rishikesh. It is made over river Ganges to cross the river and is a landmark of Rishikesh. It is said that Lakshman crossed Ganges on jute ropes between the place where this bridge is built. Lakshman Jhula was built in 1939. There are spectacular views from the bridge. And other places. In evening transfer to Haridwar. Tour Terminates. Accommodation for 9 Nights on Double sharing basis for deluxe and luxury package and quad or six sharing room for standard package as per the above itinerary.